when, due to the expense of burn- ing heavy oil versus diesel oil, the boats were converted back to die- sel oil service and the heavy-oil equipment was removed. Many lessons were learned from these years of operating on blended fuel oil and these lessons were thoroughly studied and considered when the Inland Waterways Divi- sion decided to build the M/V Rob- ert A. Kyle and make it capable of burning blended fuels. The M/V Robert A. Kyle had op- erated for approximately 950 hours on blended fuel when the decision was made to replace the power packs in the center engine. Since the first phase of the test was to be a shakedown of the fuel handling and delivery equipment, the power packs were not renewed prior to using heavy fuel even though EMD recommends chrome cylinder lin- ers when using high-sulfur fuel. EMD and the oil companies, the engines were thoroughly inspected and borescope photographs of the cylinder walls, exhaust valves and turbo screen were taken to record their condition before heavy fuel was introduced to the engine. There were no unexpected consequences attributable to the use of heavy fuel during the shakedown phase of the test. The Kyle has experi- enced no failures on the center en- gine due to blended fuel oil. Reader Service Card in the back of this issue. Explorer Class® ships are in a class by themselves. They're small enough to cruise in close to the really interesting attractions — visiting de- serted lagoons, primitive jungles, glaciers, and wildlife — even making bow landings so you can explore pris- tine beaches and uninhabited islands. And, they're big enough to give you the solid comfort we know you want- spacious staterooms, comfortable cocktail lounge, picture - windowed dining room, expansive sundecks. Enjoy hearty, exquisitely prepared meals. Be spoiled by a crew whose at- tentiveness and enthusiasm go be- yond service. See places and do things only a few get a chance to experience. Cruise the waters of TAHITI—the romantic jewel of the South Pacific. Islands, an incomparable vacation destination, or stopover enroute to or from Australia/New Zealand. Explore aquamarine lagoons, discover colorful villages on fascinating shore excur- sions, beachcomb, sun, swim, snorkel and enjoy cookouts on secluded beaches of uninhabited islands. Jungle and on the San Bias Islands. No other cruise offers so much of exotic, colorful Panama. 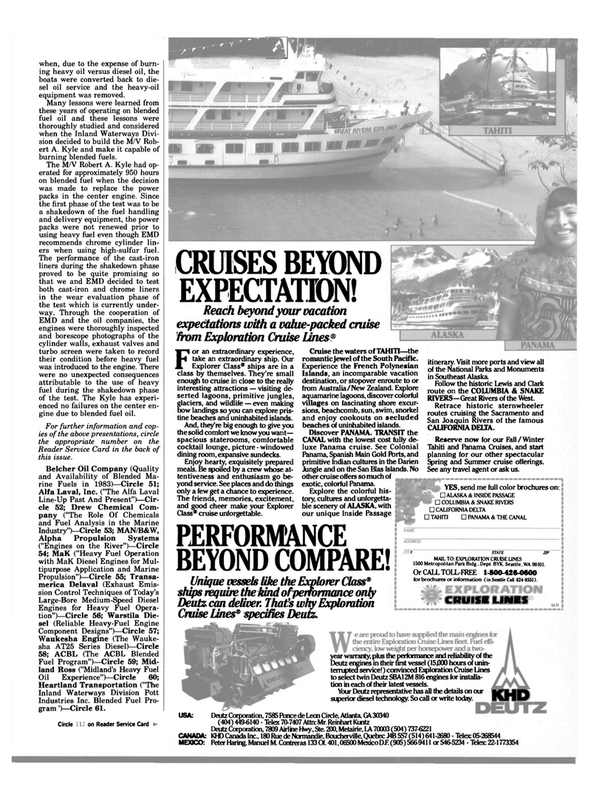 Cruise Lines® specifies Deutz. itinerary. Visit more ports and view all of the National Parks and Monuments in Southeast Alaska. RIVERS—Great Rivers of the West. Spring and Summer cruise offerings. See any travel agent or ask us. MAIL TO: EXPLORATION CRUISE UNES 1500 Metropolitan Park Bldg., Dept. BYK, Seattle, WA 98101. Or CALL TOLL-FREE 1-800-426-0600 for brochures or information (in Seattle Call 624-8551). Deutz engines in their first vessel (15JOOO hours of unin- terrupted service!) convinced Exploration Cruise Lines to select twin Deutz SBA12M 816 engines for installa- tion in each of their latest vessels.